It’s a convenient feature that, in theory, means you no longer have to carry a Mac OS X Install disc or a bootable external hard drive. But as I explained when Lion debuted, there are still good reasons to have a bootable installer disc or drive. For example, if you want to install Lion on multiple Macs, a bootable installer drive can be more convenient than downloading or copying the entire Lion installer to each computer. Fortunately, it’s possible to create a bootable Lion installer even if your only Mac is a newer model, although doing so requires a bit more work. Connect a drive—a hard drive, a thumb drive, or the like—with at least 12GB of free space. The drive must be formatted as Mac OS Extended (Journaled), and must have a GUID Partition Table. Follow Steps 1 through 4 in this slideshow to properly format the drive. 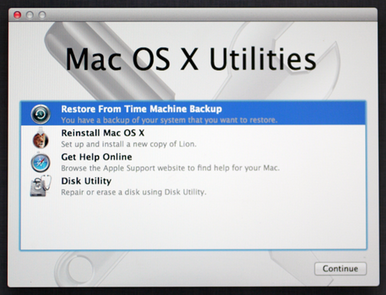 In the Mac OS X Utilities window, click Reinstall Mac OS X and click Continue. On the Mac OS X Lion screen, click Continue. You’ll see the message, “To download and restore Mac OS X, your computer’s eligibility will be verified with Apple.” Click Continue, then click Agree (twice) on the next screen to agree to the Lion license agreement. Select the drive onto which you want to install Lion. The important thing here is to select your external drive. Click Install to begin the download. Depending on your Internet connection, the download can take anywhere from under an hour to several hours (or even, if you’re unfortunate enough to be on a very slow connection, considerably longer). IMPORTANT: Monitor the download’s progress. As the progress bar gets near the end, get ready, because once the status reads About 0 seconds remaining, the progress bar will disappear, the installer will spend a minute or two cleaning up, and then your Mac will restart. As soon as the screen goes dark, unplug your external drive. If you wait too long, your Mac will boot into the Mac OS X installer on that drive, starting the installation process. Interrupting that process can leave your Mac unable to install OS X unless you restart it and—I’m not joking—zap PRAM. Once your Mac has booted from its normal startup volume, reconnect the external drive. Alternatively, you can connect the drive to another Mac and proceed with the following steps using that Mac. If you plan to use the same hard drive for your bootable installer drive that you used to download the installer, you’ll need to copy the InstallESD.dmg disk image to your Mac’s internal drive, or another drive, before proceeding. Use that copy in Step 12, below. The next steps depend on whether you want to create a bootable hard drive or flash drive, or a bootable DVD. I recommend a hard drive or flash drive; a DVD will work, but it will take a long time to boot and install. And, of course, depending on your particular Mac model—I’m looking at you, MacBook Air and recent Mac mini—you may not have an optical drive. Connect to your Mac the hard drive or flash drive you want to use for your bootable Lion installer. This drive must be at least 5GB in size (an 8GB flash drive works well), and it must be formatted with a GUID Partition Table. You use Disk Utility’s Restore screen to create a bootable flash drive or hard drive. You can now boot any Lion-compatible Mac from this drive or DVD and install Lion. You can also use any of the Lion installer’s special recovery and restore features—in fact, when you boot from this drive or DVD, you’ll see the same Mac OS X Utilities screen you get when you boot into Lion Recovery. UPDATED 2/13/2012, 9:29am, to make it even more clear that this article is aimed at owners of Macs that shipped after Lion. UPDATED 2/14/2012, 9:40an, to correct the size of the drive onto which you want to download the Lion installer. 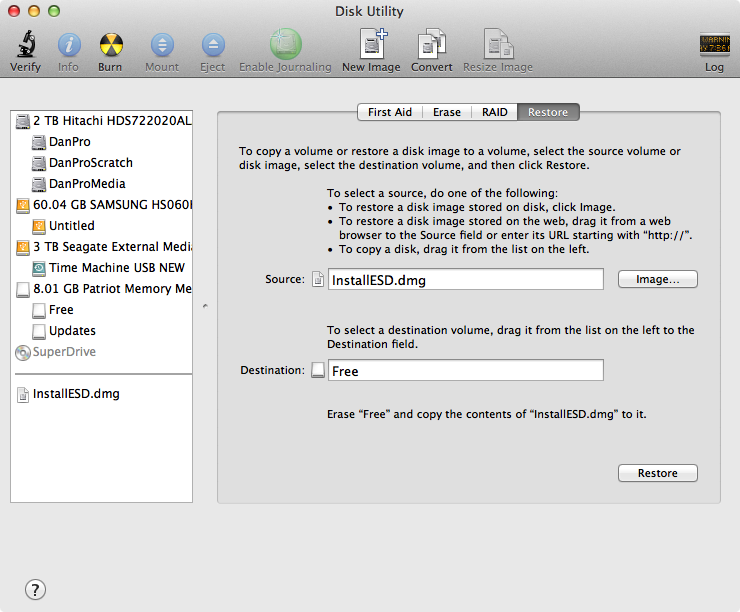 Updated 6/27/2012, 9pm, to add note about Disk Utility error message introduced with the 10.7.4 installer, and 6/29/2012, 8:20am, to correct instructions when creating a drive using the 10.7.4 installer.